Photo accompanied the article “WWI flying ace talks with pilots on Italian team”, Billings Gazette August 25, 1988. A copy of this article is filed with Kreuger’s oral history interview at the WSA. It is interesting to note that “ace” was blacked out on the copy in the file. his wish – serving in the U.S. Aviation Service piloting Italian bombers in northern Italy. Given this rather glum outlook, it is not surprising that the family eventually returned to Nebraska. After graduating from school, Herman earned a living as a teacher. In the early 1900s, airplanes were a novelty. Herman was so fascinated by the romance of flying that he built a glider in 1910. It crashed shortly after takeoff but he was not seriously injured. “It turned out that it wasn’t very comfortable and my mother put a stop to that foolishness after the first flight,” he said. Prior to America’s entry in World War One, Herman was working at an army camp near San Antonio, where he was mesmerized watching airplanes flying into and out of the nearby field. Following America’s declaration of war, he enlisted in reserve officer training but later opted for artillery and then aviation. After his training in Austin, he was shipped to France and then was finally assigned to the First Aerial Squadron in Italy where he flew Capronis, an Italian bomber. His initial responsibility was to train other pilots. A fellow pilot in his squadron was future New York City mayor Fiorello LaGuardia. In 1918, Herman was sent into combat, flying missions against Austrian forces near Padua in northern Italy. It was not without danger. The large plane with a four-man crew (Herman and three Italians) was an easy target. One occasion, after returning to base, Herman and his crew discovered 67 bullet holes in their plane. Herman flew numerous aerial missions during the last five months of the war. For his efforts he was decorated with the Italian War Cross. After the war, Herman moved to Wyoming, where he filed for a homestead and operated a car and farm-tractor dealership near Garland. He married his wife Celia Gordon in 1925 in Deer Lodge, Montana, and served many years as a Wyoming state representative from Park County. In 1937, he was selected as Speaker of the House. Herman Kreuger died in August 1991 at the age of 97. He was the last World War One pilot from Wyoming. Fall is definitely in the air in Wyoming. And with snow once again falling in the mountains, its only a matter of time before it begins to fall (in earnest) on the plains. Once upon a time, this would have sent the housewife running to her pantry and cellar to recount her food stores one more time. Thanks to modern conveniences like grocery store, freezers and refrigeration, few of us must rely solely on our gardening and preserving skills these days. In the late 1980s, the Wyoming Homemaker’s Extension Club collected oral histories from many of their long time members about their involvement in the extension service and how the programs influenced their lives. Many of the ladies also shared how homemaking and housekeeping had changed during their life. For Peggy Nelson, the interview was a way to pass on some of her extensive knowledge about preserving food to the next generation of homemakers. [I] learning how to can and preserve food… [from] two expert teachers: my mother, Mabel Wood, and Al’s mom, Fern Nelson. Both know how to have cellars full of food by the time winter came. We tried not to waste anything. 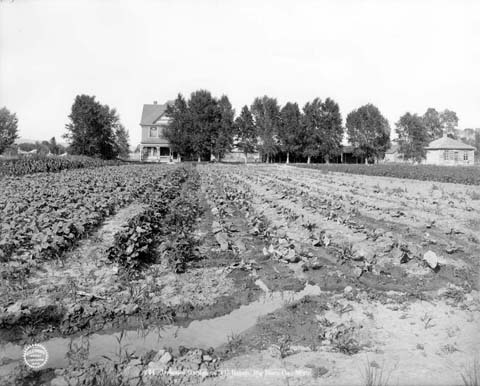 A good root cellar was a must in those days. That’s where you kept all your food for the wintertime. The equipment I used in canning was glass quart or pint jars that used zinc lids with glass liners and rubber rings. Later I used the metal rings and lids. I used a cold packing method. I used my boiler and a wooden rack Al made for the bottom. The jars were sealed and put into the warm water and brought to a boil for a certain length of time depending on the content. I never did use a pressure cooker. I canned, first blanching the vegetables and cooking and putting them in the jars for the cold water packing. The meat I fried a little bit on both sides and then used the brown gravy in the pan to put in the jars and cold packed. Salt was added to the meat and vegetable jars before sealing. Fruit was canned by open kettle in a light or heavy syrup and put into hot sterilized jars and sealed. Sugar was the main sweetener. Jams, jellies and butters were sealed with a thick layer of paraffin and capped. 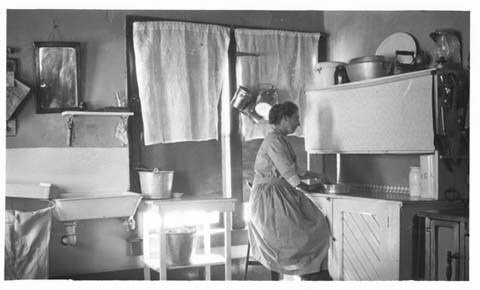 Unidentified woman working in kitchen, ca 1924. I made pickles. The quick kind was sliced or chunked and put into jars and hot vinegar and spices poured over them and sealed. These were cooked a little bit before putting in the jars. Fruit or vegetable relishes were also cooked before canning by open kettle method and canned in jars and sealed. Vegetables could be stored in crocks or wooden barrels in a brining method such as cucumbers, sauerkraut, roasting ears, green beans. A brine to float and egg was used. The crocks were set in the cellar on shelves with a cloth covered weight put on the top to keep the vegetables under the brine. A clean cloth was placed over that to keep the contents clean. The crocks were checked often and the weights, whether a plate or a wooden plank, and cloths were washed and replaced regularly. Many spices were used for pickles; black and white pepper, mustard seed, garlic, turmeric, cloves, cinnamon, sugar and dill and a good vinegar. Fruit pickles could also be stored in crocks. For example, crab apples were simmered in a sugar and spice vinegar until tender and poured into a crock and covered with a cloth and a weight. Cucumbers could be pickled by first brining then freshening in several cold waters and several day of a sweet vinegar poured over hot, each day then weighted and covered. Onions were also fixed by blanching quickly and covering with a sweet or sour vinegar to taste. Green peppers, blanched and stuffed with shredded cabbage, could be placed in crocks and a salt and vinegar brine poured over them. Grape leaves were put in the bottom and top of crocks of dill pickles and between and on top along with the dill heads. Mixed spices were added if desired along with garlic and horseradish with a salt vinegar water brine and covered and stored in a coolish warm place. Granite or enameled pans or kettles were the best to use when heating the vinegar in pickle making. In drying food. I dried corn, peas, apples, plums and squash. These were prepared and dried in the sun. The vegetables were blanched lightly. Apples were peeled and put in salt water to keep from turning dark. Plums were pitted and squash sliced thin. All were laid on sheets of cloth in the sun or attic and covered to keep clean for several days, turning or stirring occasionally. They were stored in cloth sacks and hung in a dry place. 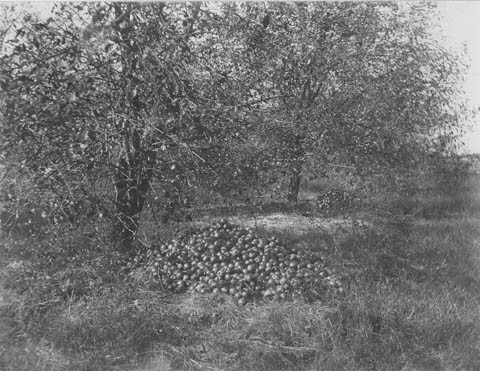 “Apples at Uncle Dunc’s on Sybille.” Duncan Grant planted the first apple orchard in Platte County. Some vegetables such as carrots, turnips, rutabagas and beets could be put in boxes or barrels with layers of clean sand and stored in the cellar. Cabbage heads were pulled, wrapped in paper and hung in the cellar, heads down or laid on shelves. Apples were wrapped individually and layered in a box or tub and a lid laid over the top and stored in the cellar. Pumpkins, melons and squash could be buried in the oat bin, or kept in a dry place away from freezing. Peggy goes on to discuss other methods of food preservation, but we’ll keep those for another time. Do you remember helping your mother or grandmother fill the pantry and cellar? What were some of the family staples? Do you continue the tradition?